The development of quantum theory in the 1920s was an amazing revolution in scientific thought. Despite living amidst uncertainty and turmoil, for a few years scientists generated new ideas amazing rate. Sometimes one wonders how much of the uncertainty of the time was related to the thoughts about the world of the extremely small . 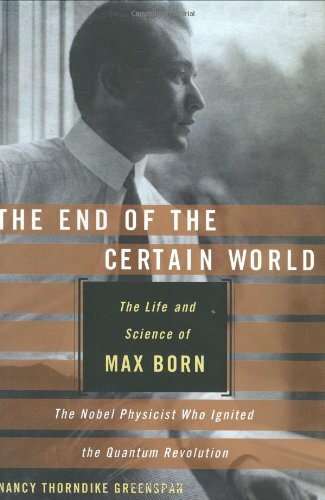 Hence the title of this book, which tells the story of one of the scientists most involved in the development of quantum theory and its probabilistic interpretation, Max Born. As is usual for a biography the book starts with Born's ancestry. I felt this was rather uneven, jumping around from one era to another. You shouldn't let this put you off though, as it quickly settles down. Following Born's life as a child we hear about his time as a student at Göttingen, where his promise was recognised by David Hilbert. Unfortunately he upset the highly influential Felix Klein, and this meant that his career did not progress as quickly as it might have done. However, his brilliance meant that he was soon a professor, becoming more and more respected for his ideas. By the early 1920's he was playing a leading part in the development of quantum theory. Max Born was part of the Jewish community in Germany, which was facing the double predicament of having lost much wealth in the First world war as well as becoming the target of rising anti-semitism. As such it's surprising quite how much of the new scientific worldview was developed by members of this community. Born's rate of work couldn't continue forever and by the late 1920's he began to slow down. Not only was the rise of the Nazis becoming serious but Max was clearly suffering from overwork, and his relationship with his wife was deteriorating. However, Born's ideas were clearly influential in the further development of quantum theory. It is here that I would have liked more information on the spread of Born's ideas, such as the probabilistic nature of quantum theory. I for one think that the peculiar nature of this theory is partly due to the environment in which it was concieved, and would like to understand more about this. Greenspan concentrates more on the sometimes slow recognition of Born's place in the development of the theory, such as being passed over for a Nobel prize in the early 1930's. The book has quite a bit on the ups and downs of Max's relationship with his wife Hedi (Hedwig) Born. She was clearly not satisifed to be just the wife of a successful physicist, and attempted to find a more meaningful existence for herself. It is interesting to see how this affected her view of physics, especially in her communications with Einstein. Much of the input to the book was from conversations with his daughter Irene Newton-John - it is much more detailed in the parts of his life where Irene was present (from her early recollections to her move to Australia in 1953). We don't hear much about the last 16 years of Born's life, after his Nobel prize in 1954, but as he was living a quiet life in retirement maybe there isn't much to tell. Irene's life had much of interest - early life in Germany, then Cambridge academia, followed by life in Australia with show-biz descendants and I have to say that it looks to be worth a biography in its own right - or maybe even a TV series. The book sticks to a strictly chrononlogical order of events which I thoroughly approve of. Sometimes I realised that a conversation or the like might have later significance, and this might be confusing to someone with no background knowledge, but one can always reread the book to better understand the significance. One thing that sometimes irritates me with biographies is when they seem to degenerate into a list of people who the subject met from day to day. (Autobiographies don't seem to do this so much). This book does concentrate quite a bit on Born's interaction with other people, but it didn't seem to suffer from this problem. Again I think that this is due to the strict chronology - other books break up the flow of the story by telling about the future lives of the people the subject met. This book is aimed at a non-technical readership. Indeed, if you are mostly interested in the science then you might to want to look elsewhere, although I would suggest reading this book as well. What the book does well is to show the reactions of different scientists to the politics of the era, as well as dealing with some of the politics internal to science. Greenspan is an experienced writer and manages to maintain the flow of the story, to produce a work which is well able to hold the reader's interest. I would recommend the book to anyone interested in the influence of the wider social environment on the development of science.